On the corner of Greencroft Street and Winchester Street are Blechynden’s Almshouses. These were founded by Margaret Blechynden in 1683, and were renovated in the 1970s. When they were built, the City provided welfare in the form of the workhouse. By contrast, churches, charities and private legacies provided more comfortable homes to many of the elderly – almshouses -with wardens to keep an eye on their well-being. Almshouses, unlike the workhouse, carried no social stigma. You could even retain any small private income you had. Today, there are still over 200 almshouses in Salisbury caring for the elderly. Continue left a short distance up to the top of Winchester Street until you get to the underpass and flyover. You are now standing near what was one of Salisbury’s main entry points until the 1970s and the coming of the Ring Road. The mediaeval gate and gatehouse stood here and you can see that some of the adjacent old houses still exist. Traffic coming in from the north-east travelled along the London Road, which ended here at that time. It then swung down Winchester Street towards the City Centre. Return back down Winchester Street. Crab Apple Cottage, No. 80 Winchester Street, is the tallest building in the vicinity. 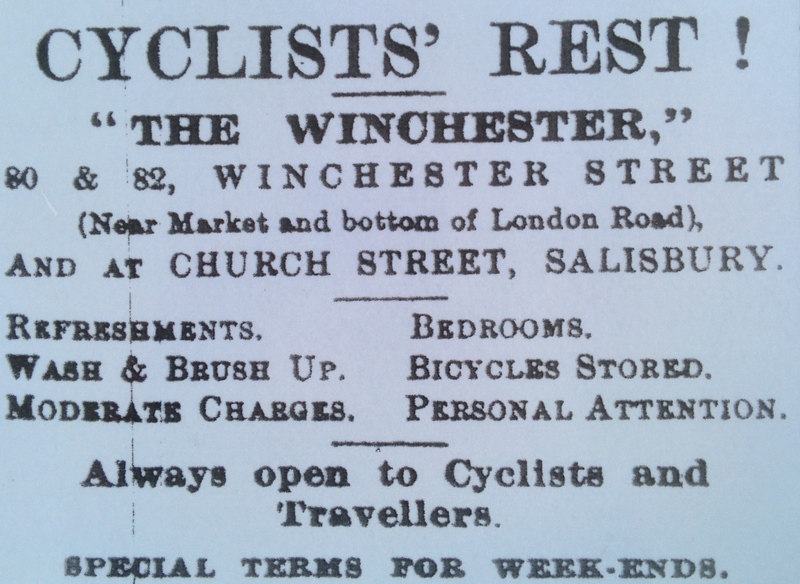 In the 1900s, it was an establishment called – The Winchester Cyclists’ Rest. It offered a wide range of services to the passing traveller – particularly the bicycling traveller. It was run by an ex-soldier called Richard O’Leary and his wife Minnie. 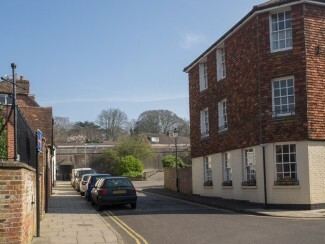 As you can see, the building was large enough for the variety of services on offer and its location, at one of Salisbury’s main entry points, meant a there was good ‘passing trade’. Every week people cycled in from outlying parishes for Salisbury’s two weekly market days. Hundreds of recreational cyclists flocking to Salisbury in the evenings, on weekends and holidays would have been a major boost for the Cyclists’ Rest too. Just about every community and institution in the land boasted a cycling club – after football and cricket – it was probably the nation’s most popular form of exercise! Richard and Minnie were active radicals in politics. Both participated in the campaign for women’s suffrage and Richard was a founder member of the Salisbury branch of the Labour Party. Indeed its weekly meetings were held here until they became too large for the premises. Richard was also an inveterate writer of long letters to the Salisbury Times (the local Liberal newspaper), on subjects as diverse as politics and ‘the morality of music’. 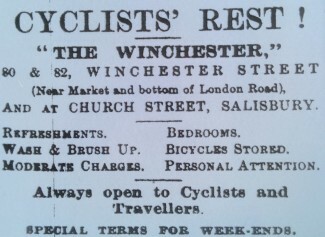 When Richard and Minnie came to Salisbury in 1901, they lived at No. 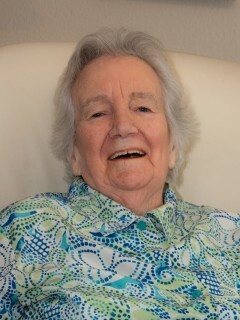 80 and had two children, Galbraith and Eileen. Eileen would have played in Guilder Lane and the Greencroft, with her best friend, Carrie Mould. Carrie was the daughter of Sydney at No 64 Winchester Street. The two girls were very close playmates and both keen young pianists. Eileen attended St Thomas’s Girls’ School with her friend Carrie. She must have been a clever pupil, because in her late teens she was a cashier in the Silver Street branch of Thomas Lipton’s, then Britain’s most prestigious grocery retailer. 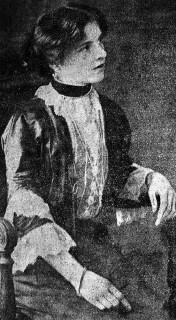 At Lipton’s she met and married one of the firm’s highfliers, Neal McNamee. In 1912 he and Eileen were selected to run a major part of Lipton’s operation in the U.S.A. and set sail on the Titanic on its ill-fated maiden voyage. Eileen’s body was recovered, but buried at sea. Neal’s was never found. Cross over the road and continue down Winchester Street on the left hand side until you reach No 64. Go to Heaven when you die! Sydney and Lucy Mould ran a restaurant at No 64 Winchester Street until the mid 1930s. As his advert boasts, Sydney could provide your main meal of the day for a mere six pence. The specialite de la maison was faggots and peas. Dried peas were put to soak in zinc bathtubs out in the back yard. Throughout the First World War, the Australian Army contracted with the Moulds to supply daily meals for a unit of forty of their soldiers based in Salisbury. So it must have been good! Opposite No. 64 Winchester Street is The Anchor and Hope, one of Salisbury’s oldest pubs, dating from the Middle Ages. When the O’Learys came here in 1901, it had a notorious reputation as ‘a rough boozer’! The sitting tenant, Arthur Jones, was a Welshman with a short fuse and a heavy stick which he regularly employed in the interests of good behaviour. Churchill’s Lodging House was immediately next door at Nos. 65 and 67 Winchester Street.. The house extended back, parallel to Greencroft Street, for about 50 yards. It had over SIXTY small rooms – but no bath and only basic toilet facilities. It was known as a ‘Common Lodging House’ providing the cheapest possible lodgings for the poorest possible lodgers. Mary Smith remembers Churchill’s Lodging House. Listen to the audio clip at the right of the page or on your downloaded MP3 file from the Downloads page. Return back to the crossroads and turn right into Guilder Lane. Louisa Churchill ( Mother of Salisbury and Reading footballer Tommy Churchill) was my great grandmother. She was remembered by many as quite a formidible but respected character. The chief of Salisbury police attended her funeral . It sounded to be a typical doss -house of its time. Sad that it was flattened – it looks to be very old – it should have been sympathetically restored. Regarding Churchill’s Lodging House in Winchester Street, my father was one of the workmen who dismantled the building, and he remembers the long corridor with little rooms off it, he also remembers taking out the timbers – which were mostly full-size timbers a foot square, with big heavy crude planks of an inch and a half thickness – and between some he found several old pennies, clearly dropped there by a tired person once. Presumably the users of Churchill’s were often not in the best condition or sobriety when they took their rest.